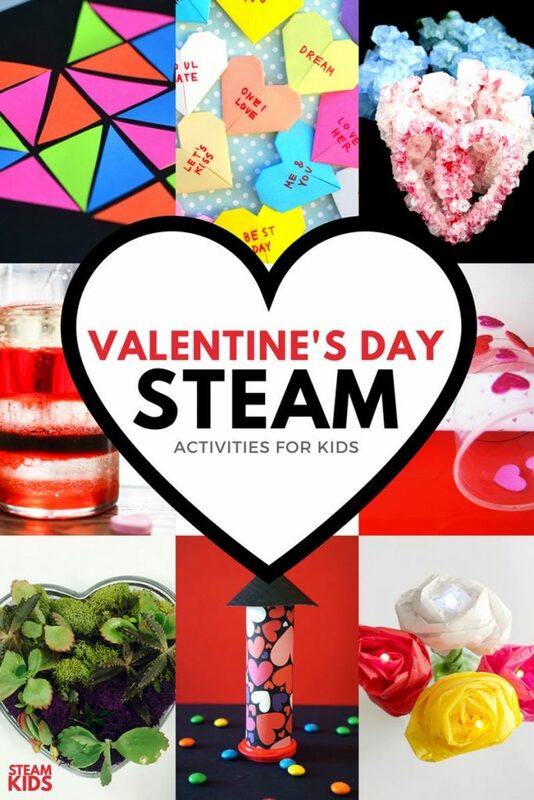 Your Valentine’s Day just got a little STEAM-y! 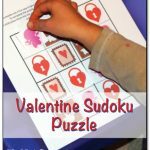 Today we released our next STEAM Kids book and this time the theme is Valentine’s Day! 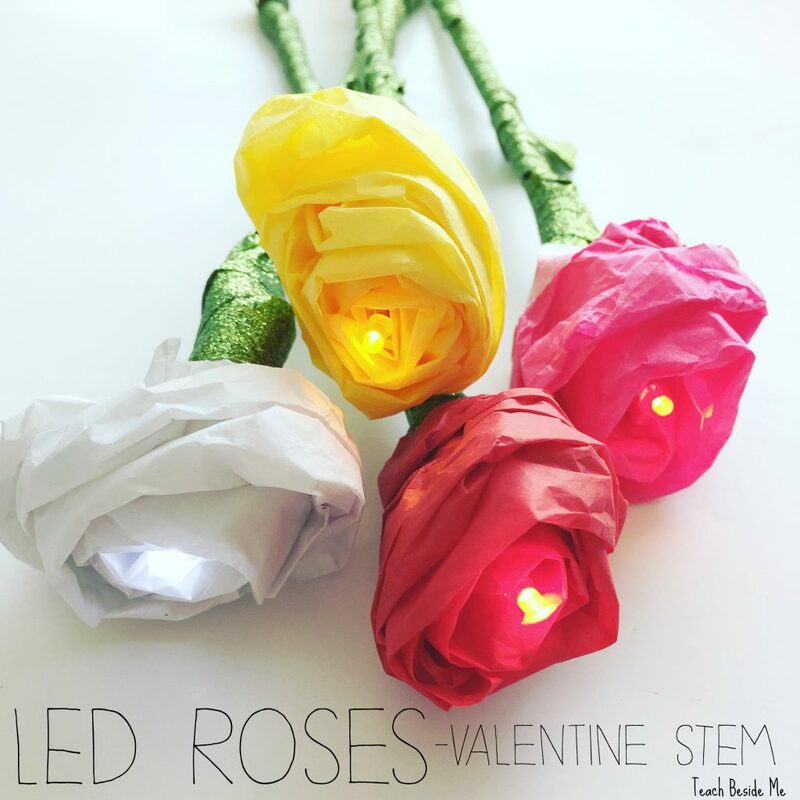 My contribution was these LED Roses. 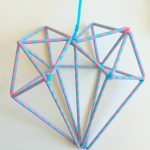 I am going to tell you in on how to make them today, but this is just one of the many cool projects in the book! So, make sure to check it out! Now. 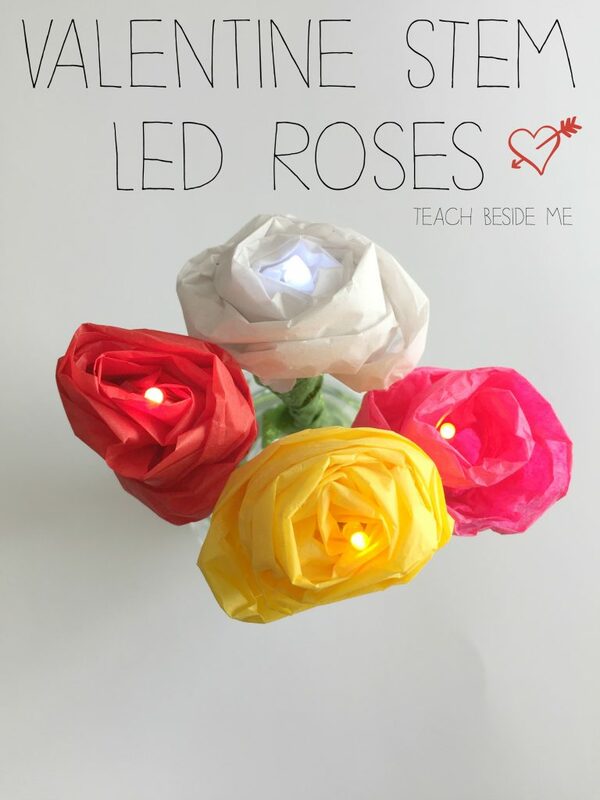 . . want to learn how to make these fun LED Roses? Begin by cutting a long strip of tissue paper about 4 inches wide. Fold it in half length wise. Fold it down twice at an angle. Tape the LED battery around the sides of the coin cell battery. The shorter pin goes on the negative side. If it lights up, you are good to go! Place the battery with the bulb on it right onto the second fold of the paper. Add some scotch tape to secure it in there. 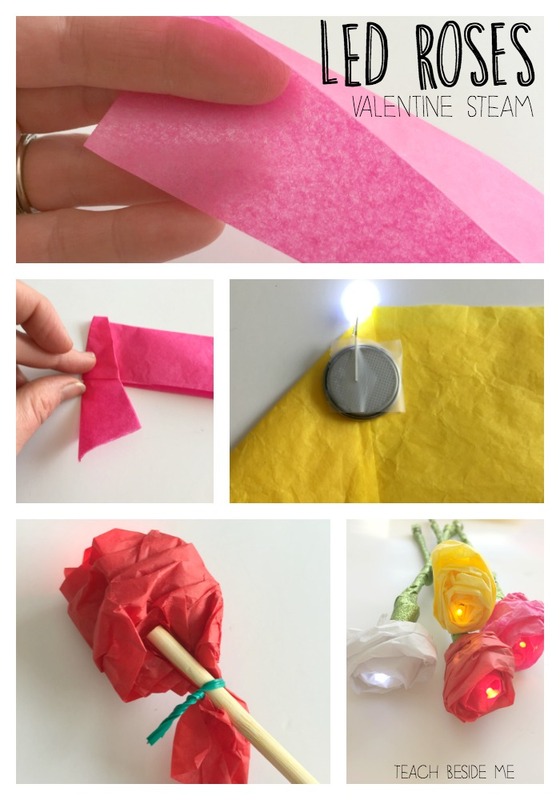 Continue wrapping the paper around the battery until you form it into a rose. Secure the tail end with a twist tie or more tape. Once it is secure, wrap with the green tape to make the stem. 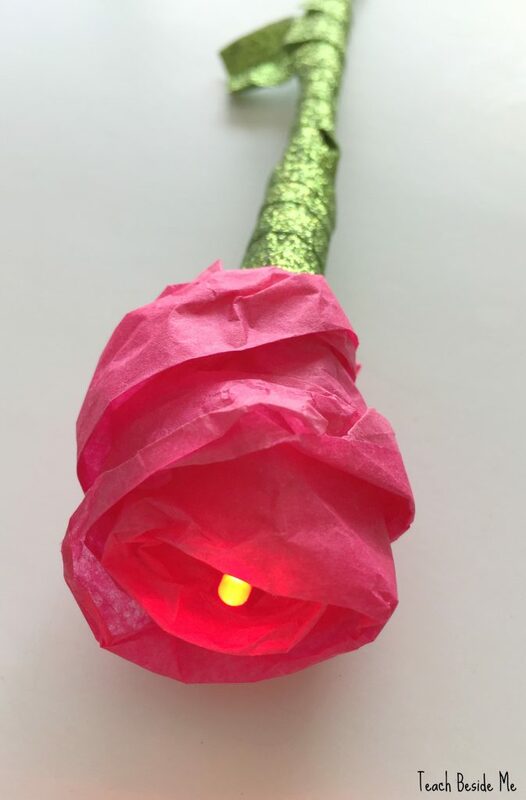 Cover the bottom section of the paper and wrap all the way down the stem. Fold out a section or two to make leaves. Easy enough?! The fun thing about these is that the light will stay lit for days! & you can always replace the battery if needed. We made several and had them in a vase and they were so pretty! It would also be a really cool non-candy valentine to give to friends. 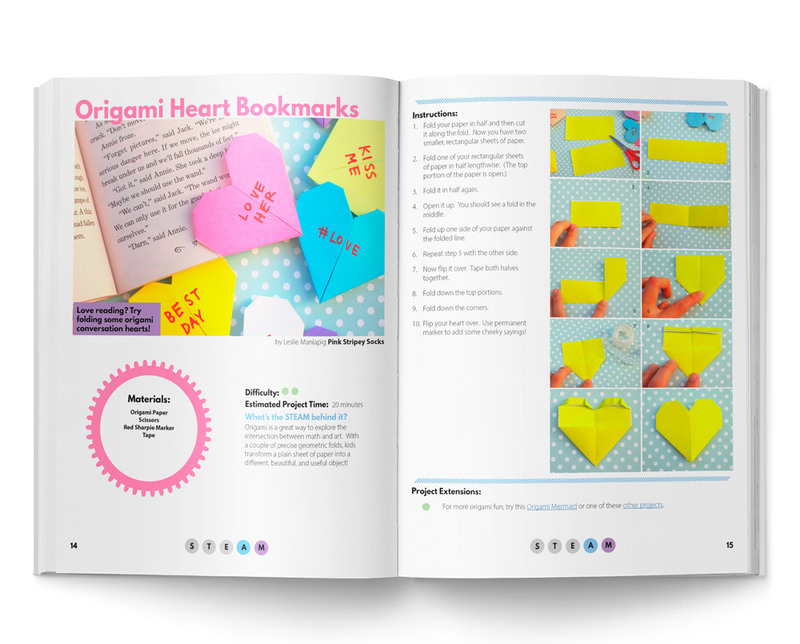 This Valentine STEAM book includes projects, challenge cards, and planning guides. These STEAM Kids books make lesson planning a breeze! 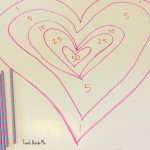 There is a bonus heart tessellations drawing activity too! 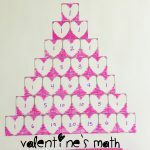 STEAM Kids Valentine’s Day is a PDF ebook available for sale on steamkidsbooks.com only. RIGHT NOW we have a SALE price of $4.99, but it will go up on 2/1/17 to $7.99. 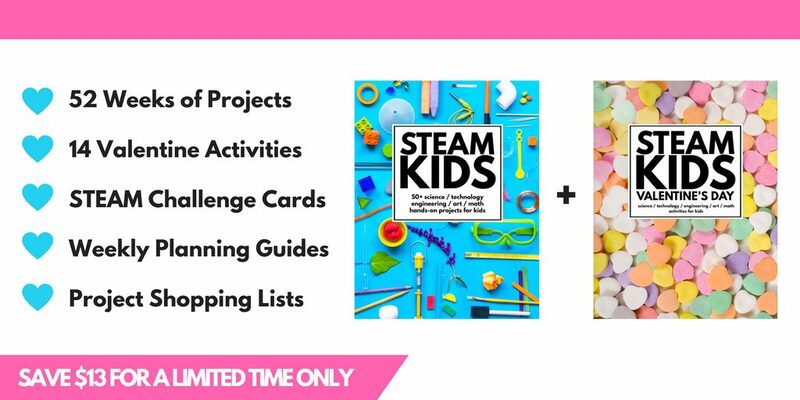 The Valentine Bundle: STEAM Kids + STEAM Kids Valentine’s Day is just $9.99 (now through 2/1/17 regularly $17.99 after the sale.) If you are in countries with a VAT Tax, THIS IS THE LINK for you.